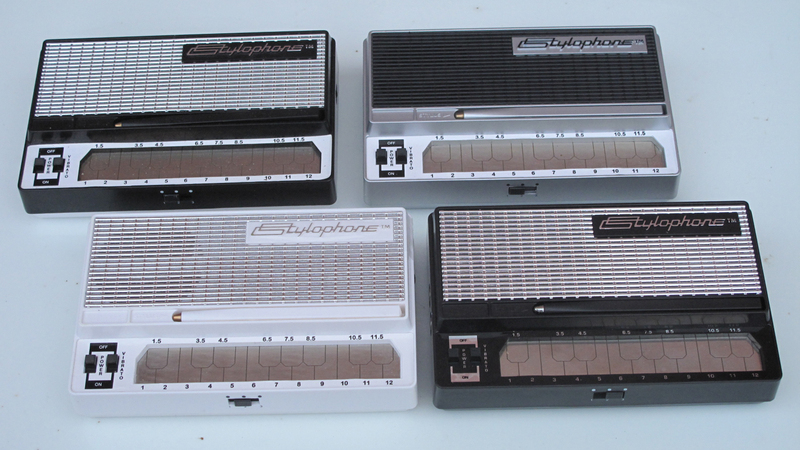 As I said in my first post on the Stylophone, there have been a number of variations in Stylophone design over the years, so I thought I would illustrate some of these from the examples in my collection. 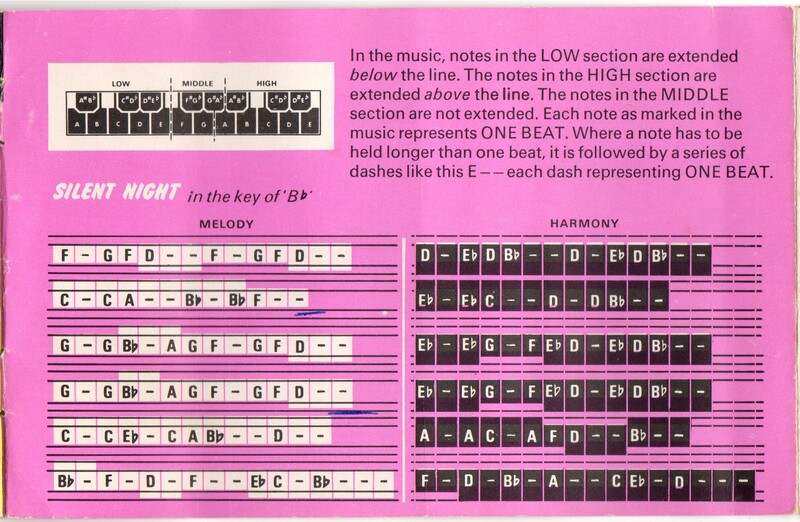 This early variation is distinguished by the non-playable black sections of the keyboard. There were three types, distinguishable only by the body colour – the black one illustrated was the ‘standard’, but there was also a white one, the ‘treble’, and also a ‘bass’. I don’t know what colour it was: I’ve only ever seen it in pictures, and it looks like a reddish-brown to me, but I’m colour-blind, so an unreliable witness . . . I hope in time to get hold of one, and somebody will tell me if it is indeed brown! 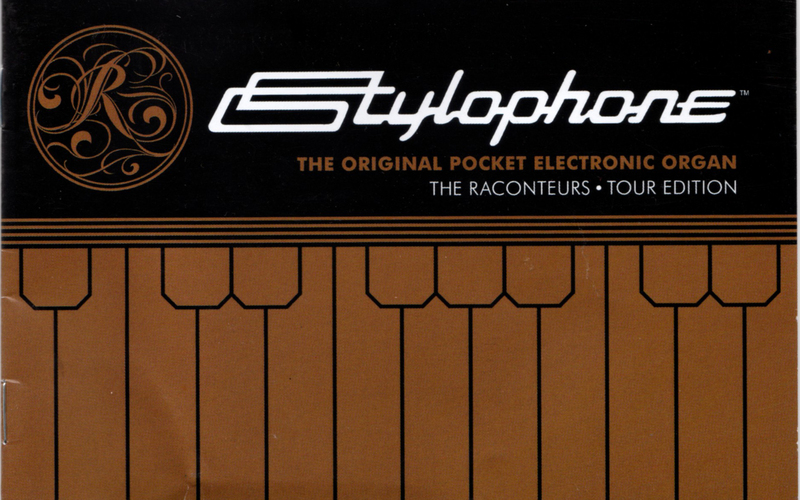 The black sections of the original keyboard had been a feature of Brian Jarvis’s prototype – which you can read about here: http://www.stylophone.com/Prototype.html – but the next generation of Stylophones dispensed with them. 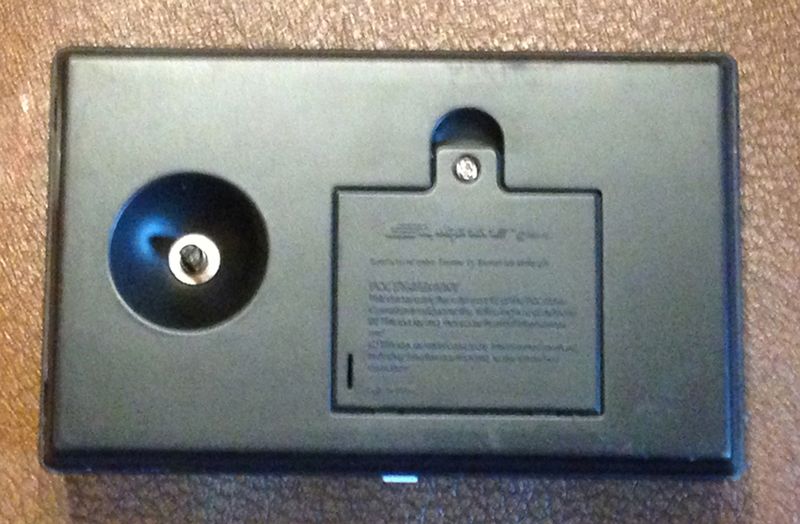 Note the identical case design to the original, but the keyboard is now completely silver. 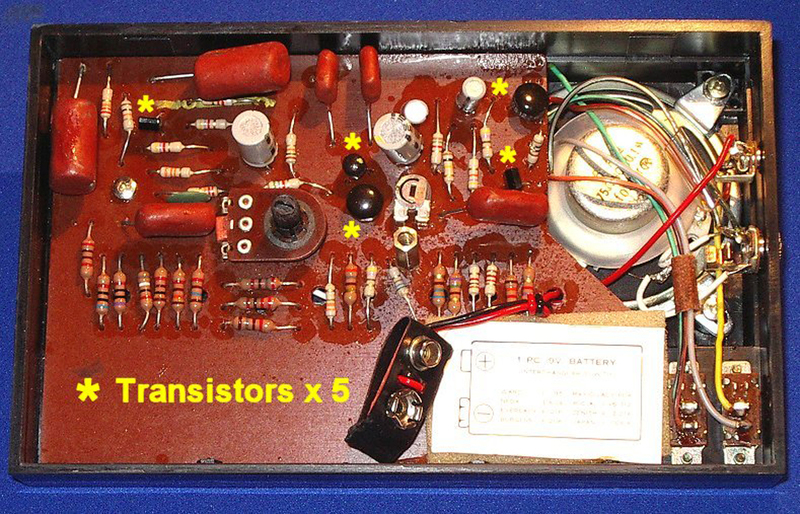 (Ignore the switches on the sides of these instruments – they’re a speaker cut-out modification I made to them many years ago). 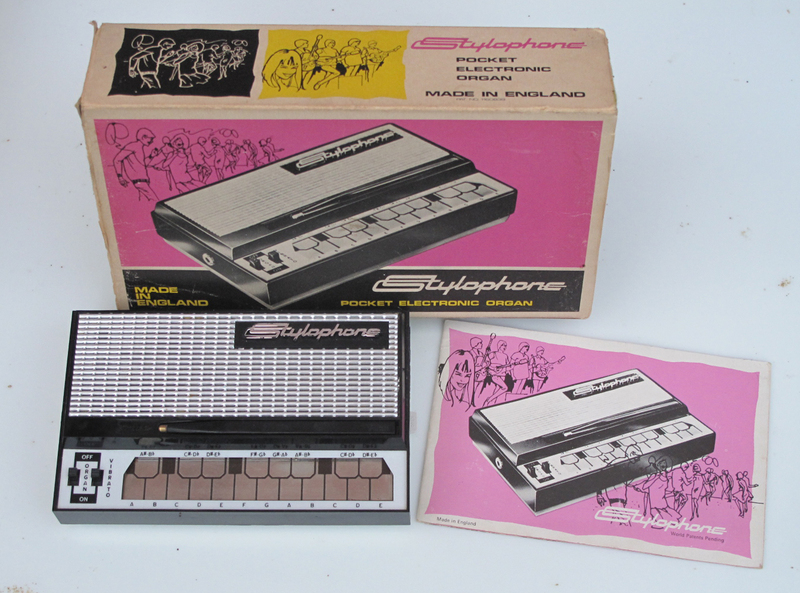 The circuits in all these early Stylophones were quite similar, although not identical. 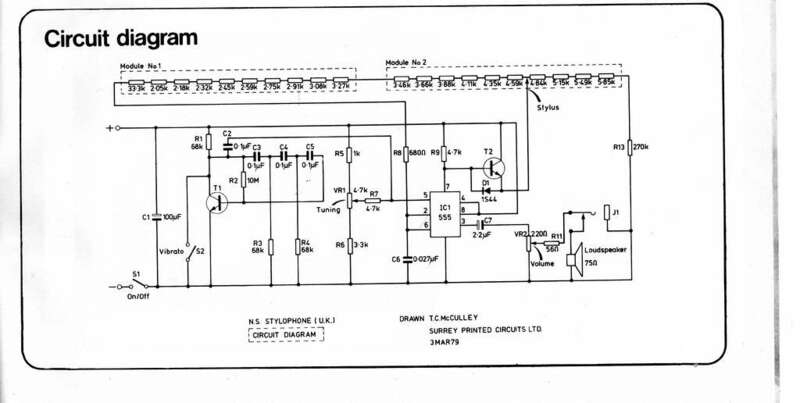 The instrument was subject to constant development, and there are versions with all discrete components, including the resistors which determine the pitch of the notes, and versions with different types of resistor modules – rows of resistors in a single unit. 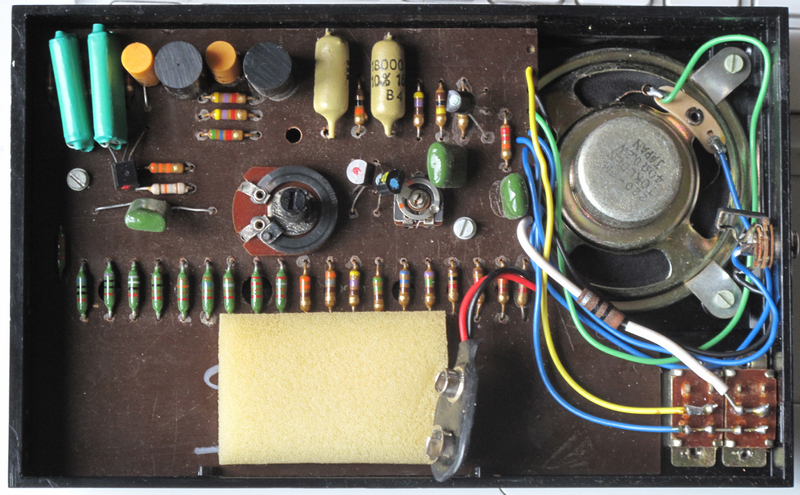 (Ignore the large resistor at the back right-hand side – this is attached to the speaker cut-out mod). 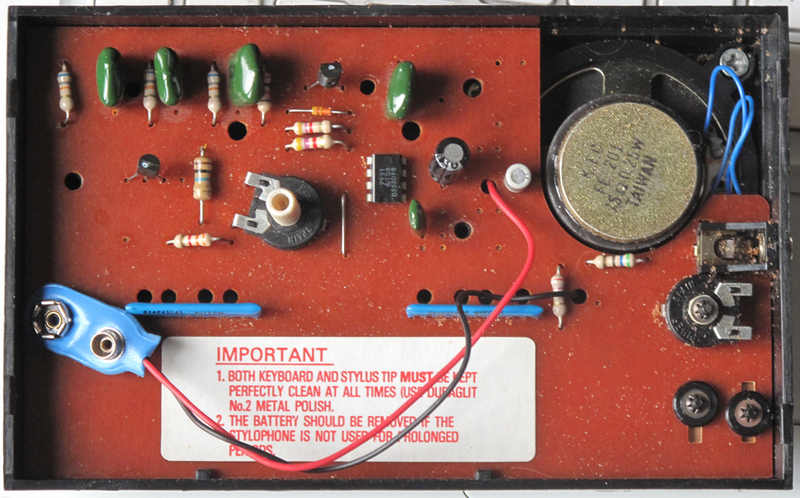 Other slight changes were made to the component layout, and the style of the switches in the bottom right-hand corner is different. 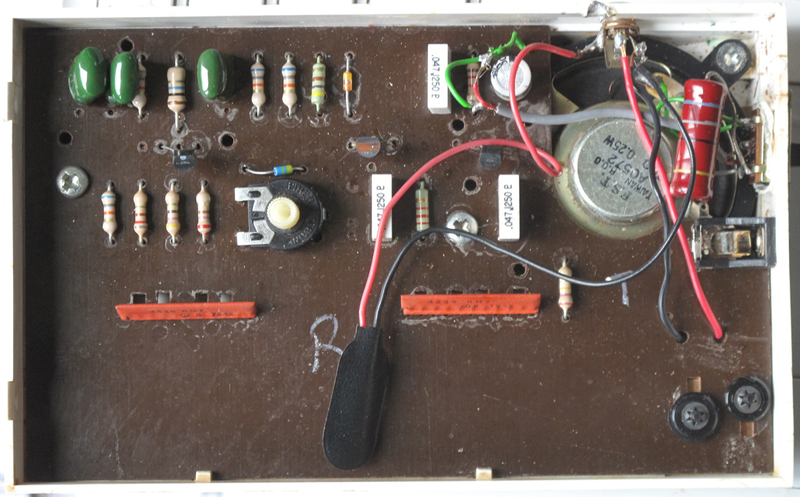 (Once again, ignore the non-original large resistor next to the speaker). 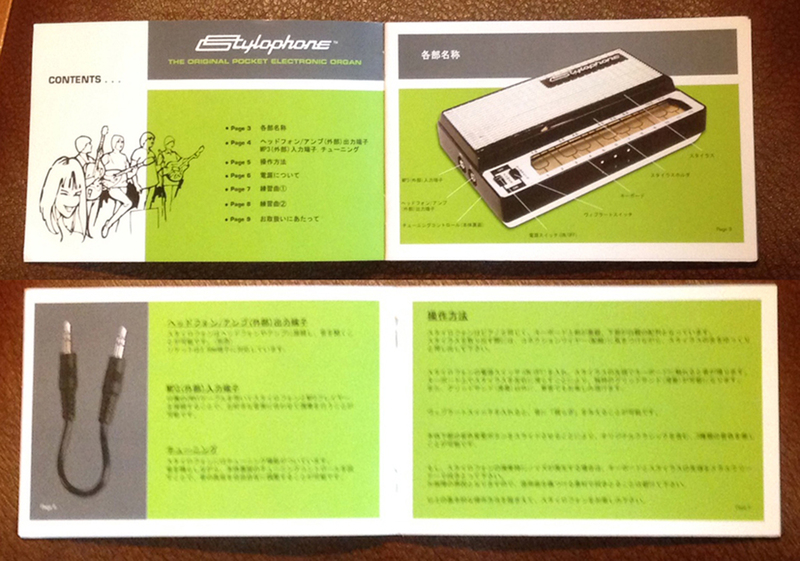 (These are the same two black and white Stylophones shown above). 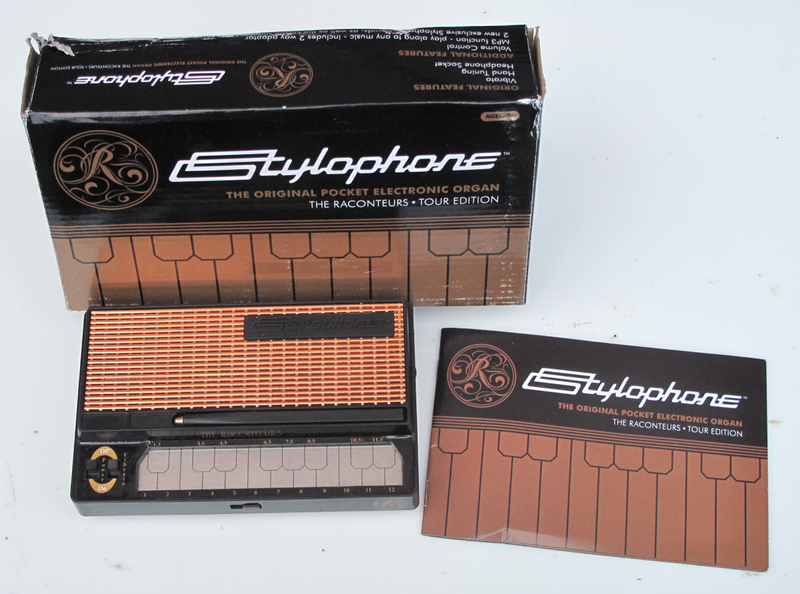 Edit: However, there is a photograph of an object from the collection of the Museum of Design in Plastic at http://www.modip.ac.uk/artefact/aibdc–002025 which shows an original issue Stylophone (the one with the black sections on the keyboard) in its packaging: and one of the items included is an overlay for the keyboard surround. First of all, this is white lettering on a black background, rather than black lettering on a white background; secondly, it uses numbers, not letters for the notes. 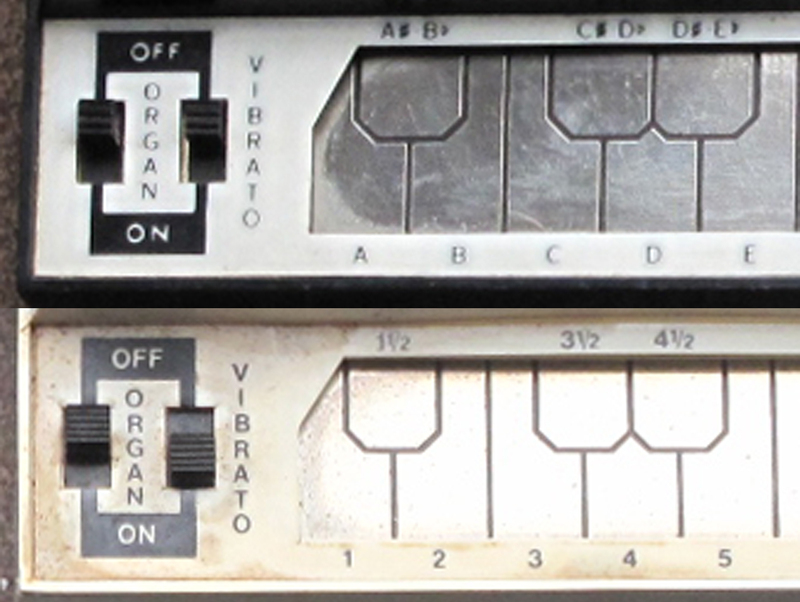 This Stylophone featured, for the first time,a volume control, which can be seen on the left of the front panel, just above the on/off and vibrato switches. 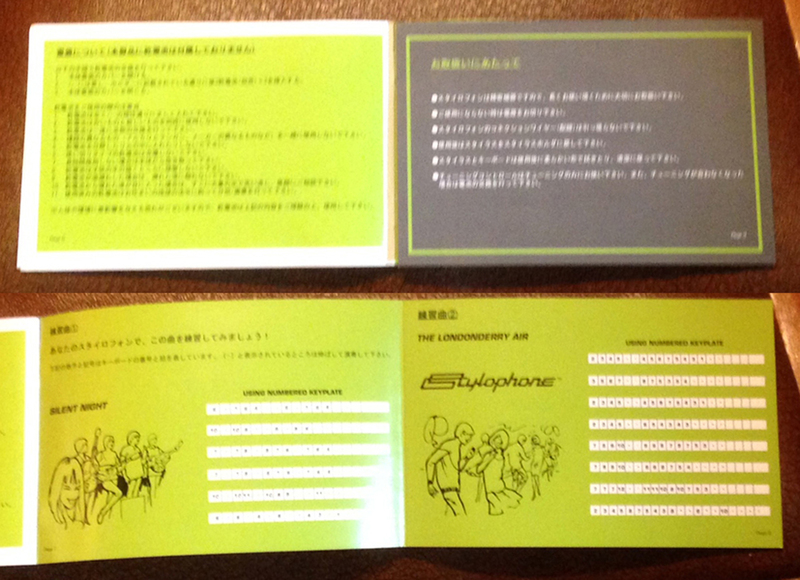 Read the New Sound Booklet. Edit: Not part of my collection, but of interest nonetheless, is a variation made in Hong Kong and sold mostly in the United States. These are described in detail at http://www.stylophone.ws/hk.html, but a correspondent, ageing60hippy, has sent me some very nice photos of one that he has. 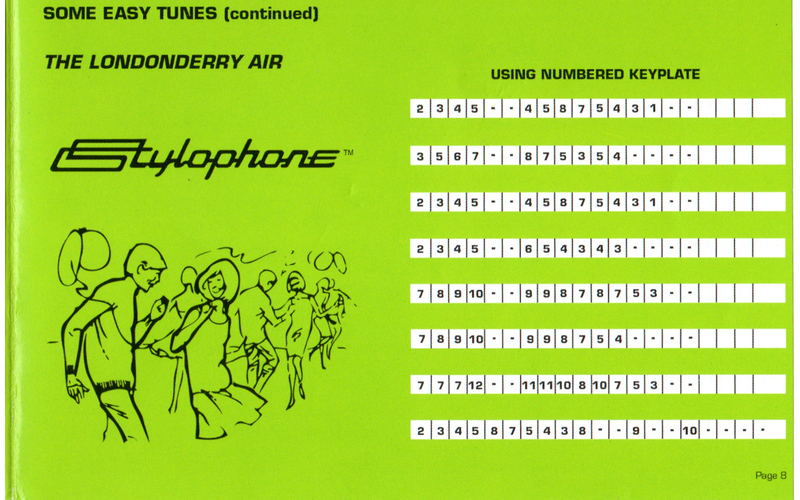 It can’t be stated for certain if these stylophones were copies as a number were manufactured under licence at this time, but they have several features which differ significantly from the versions being made in the UK. 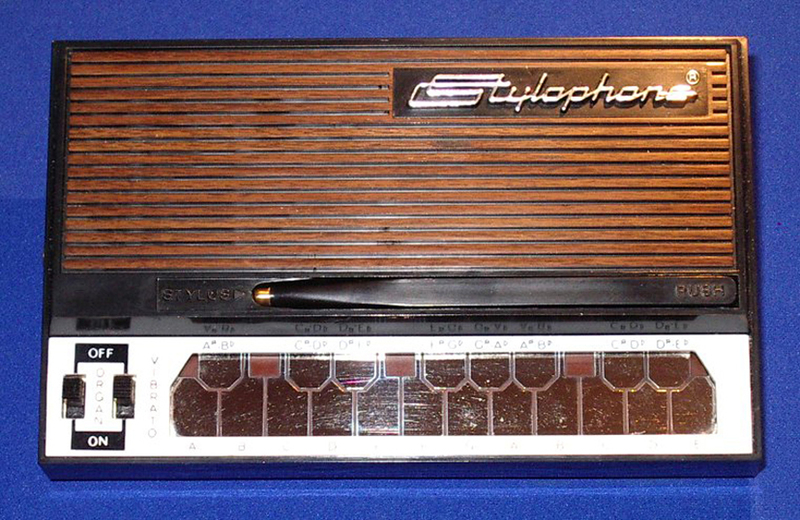 Note the ® symbol after the Stylophone logo on the front grille, the socket for an external 9v power supply, and the small battery compartment on the back. 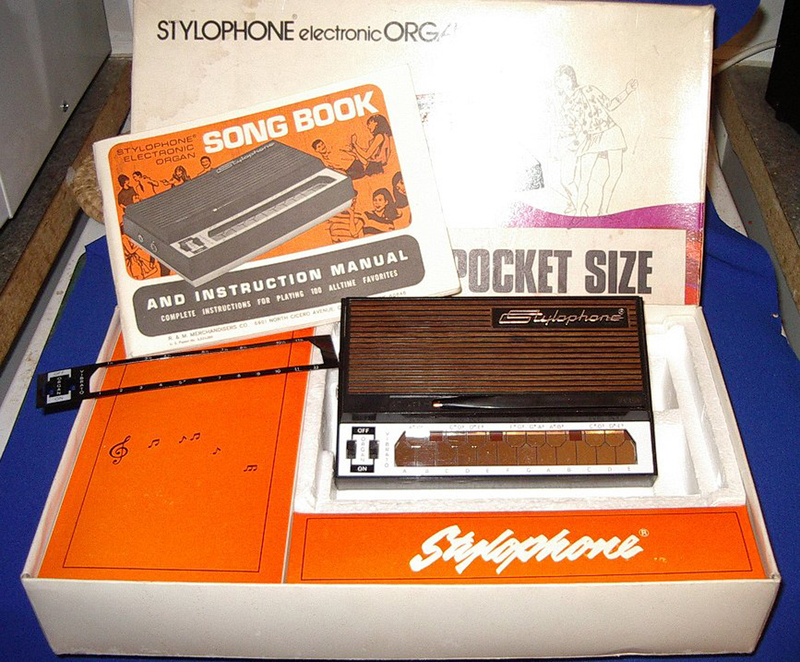 All of these early series of Stylophones offer opportunities for modification and circuit-bending: the electronics aren’t complex, circuit diagrams are often available, and the components themselves are large and readily accessible. 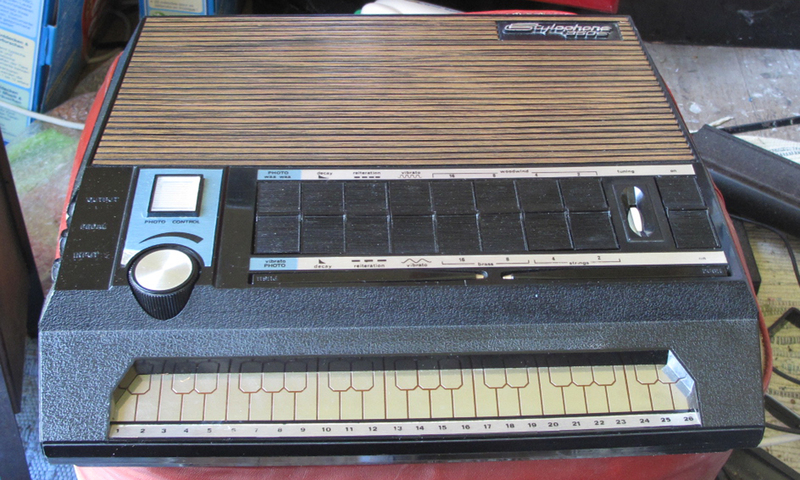 I haven’t worked on these much, but my SoftPot Stylophone is a modified ‘2nd Generation’ treble version. 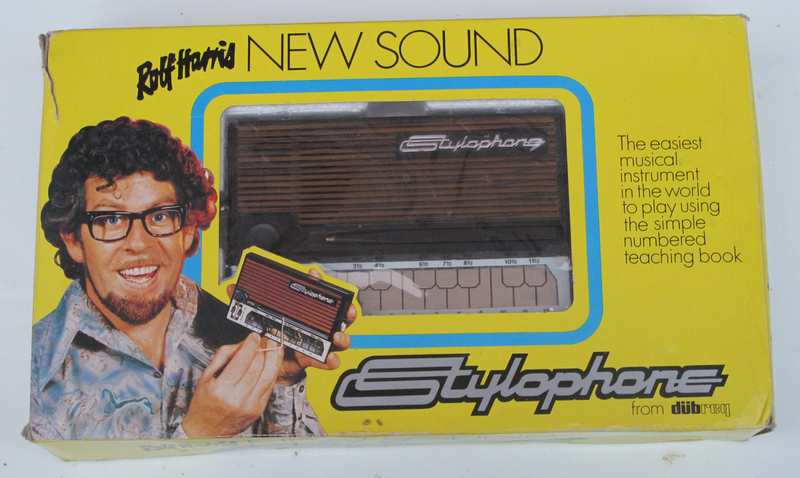 The ‘Hedgehog’ uses a Stylophone ‘New Sound’. 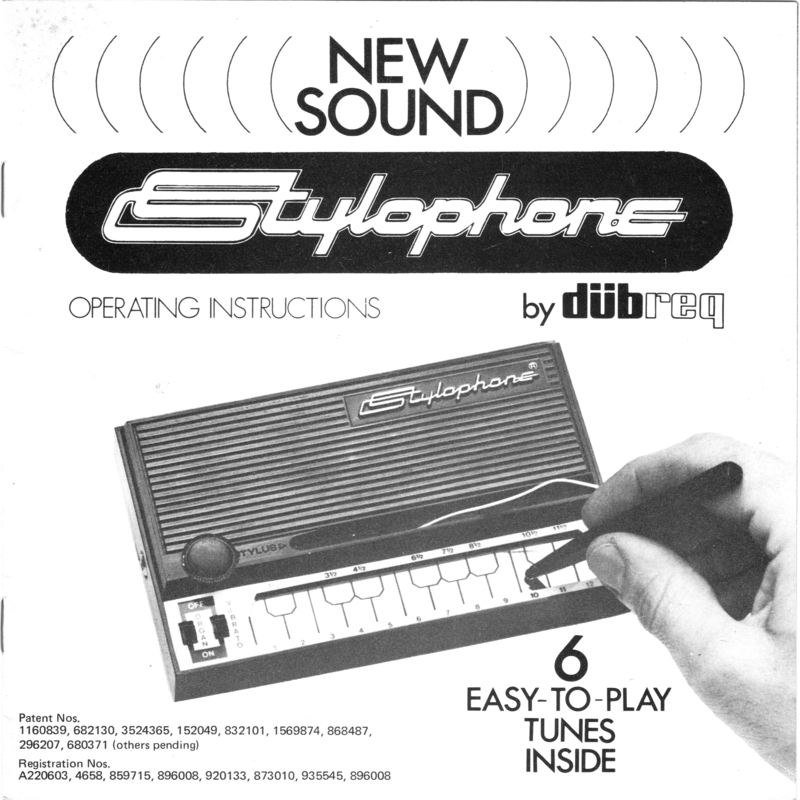 Production of the original Stylophones ceased in 1980 and the manufacturer, Dübreq, moved on to other things (‘Top Trumps’ playing cards! ), but in 2006 the design was revived. 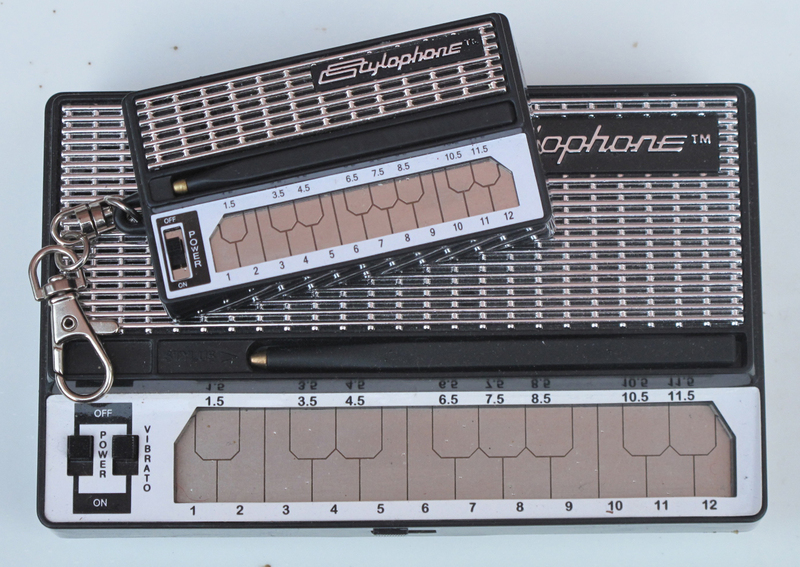 Unlike the earlier Stylophones, the colour isn’t an indication of different sounds – as all S1’s have 3 tones, there was no longer any need to make three different types. They’re all identical on the inside – although I did have the impression that a little more care was given to the assembly of the Special editions, compared to the standard version. They’re very uncommon in Europe and I’ve never seen one. As you can see, it’s VERY black! I like the contrasting white switches]. Another rare variation of the S1 is the so-called ‘Raconteurs Tour edition’ – a special version made to be sold as part of the merchandising connected with The Raconteurs, a band formed by Jack White after the dissolution of the White Stripes. 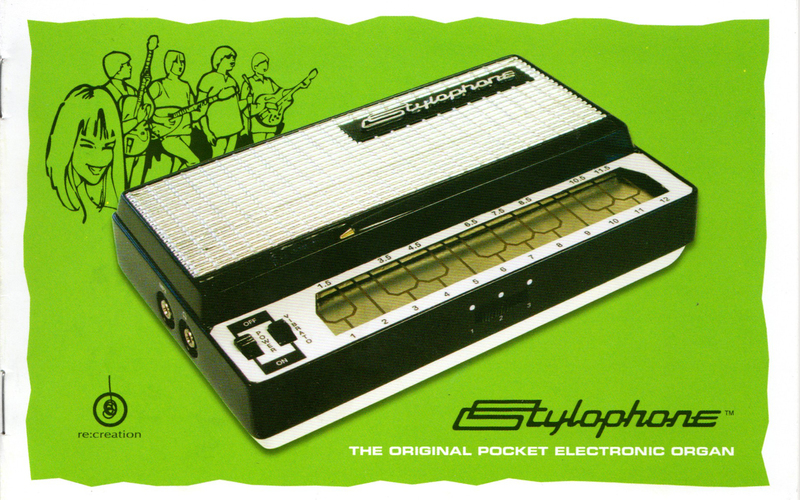 According to a concert-goer (at http://cousinsvinyl.com/2008/dude-check-out-the-merch-raconteurs-and-black-lips-play-the-fillmore-detroit/): ‘I was very curious to see what a Stylophone was. 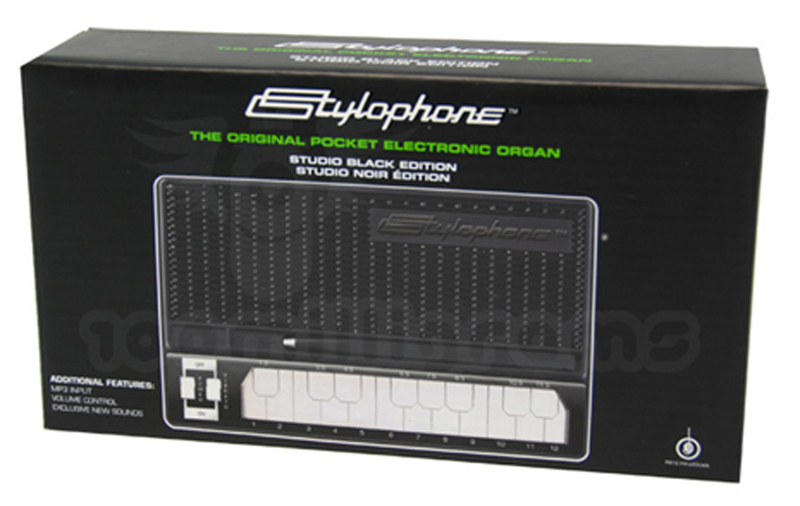 The box read “The Original Pocket Electronic Organ”. My friend said, “Dude, you’re going to want to get one of these,” as he opened the box. 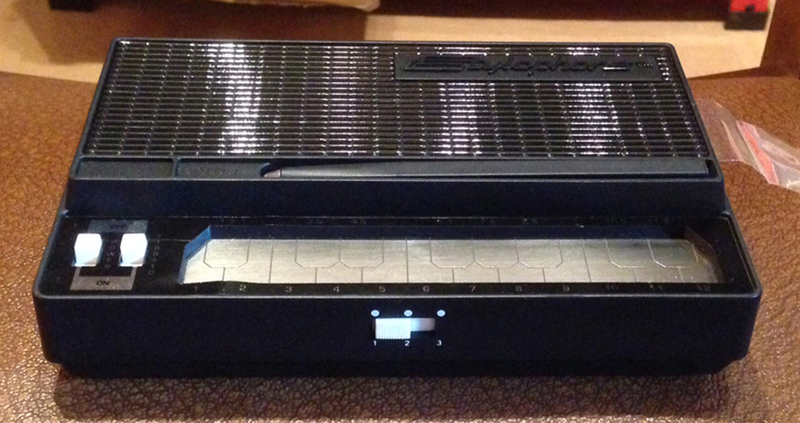 It was $40, but worth the money: it’s a working instrument with the Raconteurs logo on it. The next day, it was worth $200 online.’ Mine was a lucky find on eBay, but these can be very expensive when you come across them, usually more than the original $40 price tag. 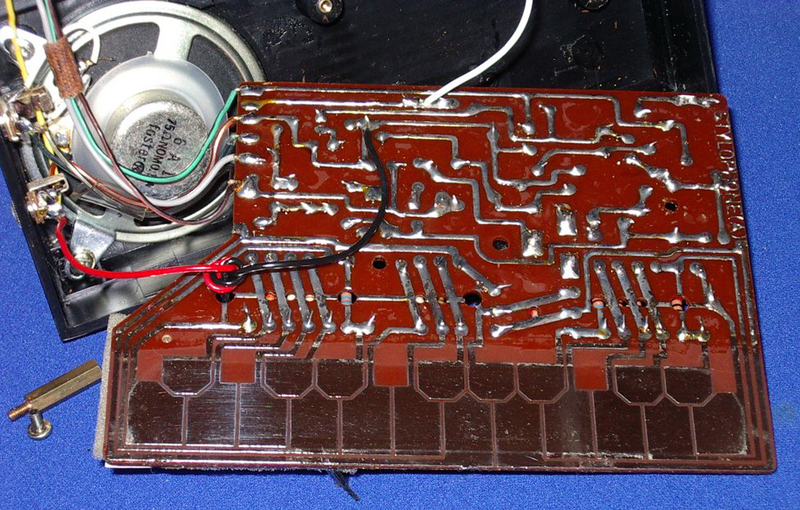 The circuitry of the S1 is very different from the earlier Stylophones, being based on a tiny digital chip which you can’t even see as it’s covered in a blob of protective wax. 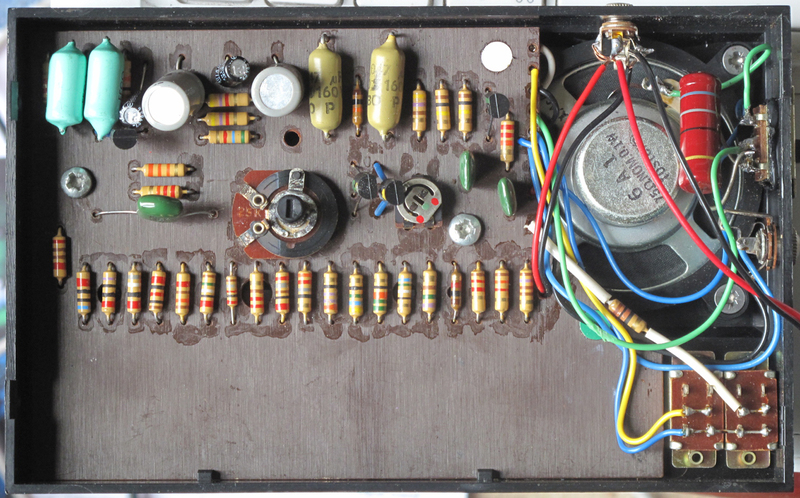 It has a separate amplifier circuit board. 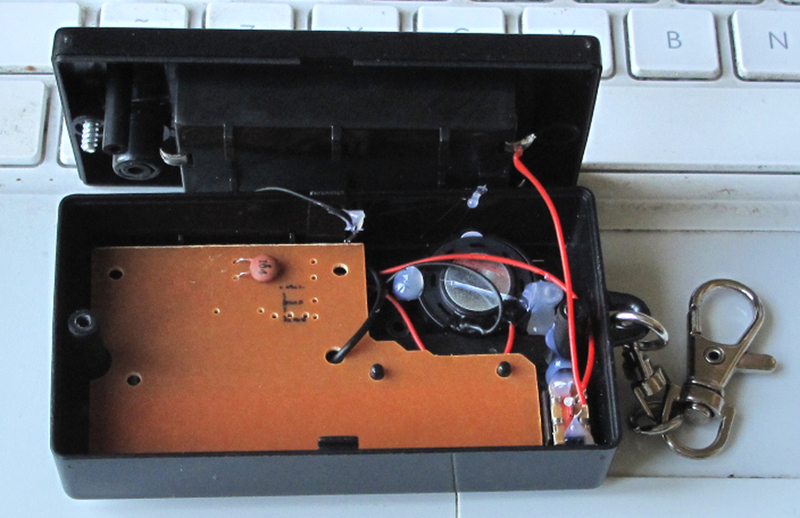 It also runs on 4.5v, not 9v, so instead of a PP3 battery it takes three AA batteries. 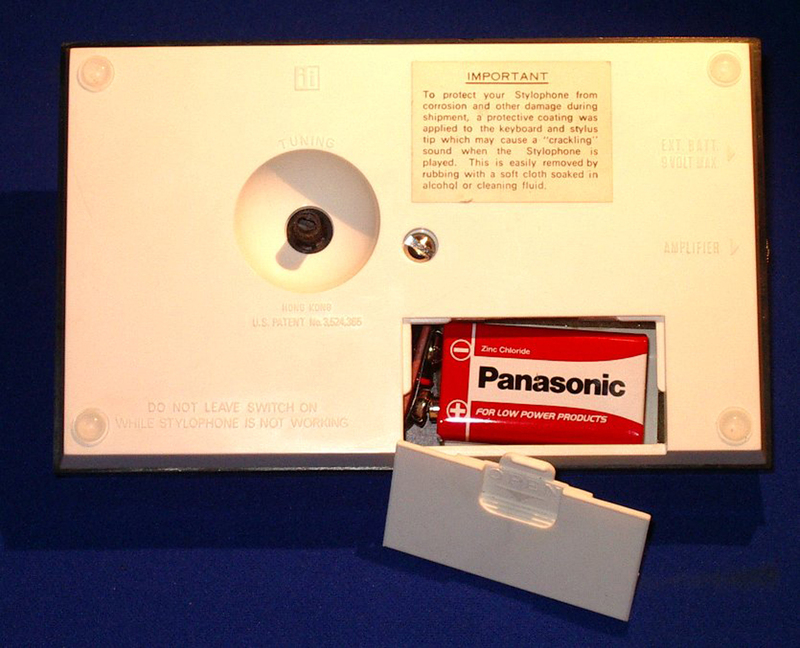 These are not inserted by removing the back of the instrument like the earlier ones, but are held in a battery compartment accessed from outside. For this reason, the S1 is glued shut and getting to the inside of it for the purpose of modification (or troubleshooting) is not a simple matter. 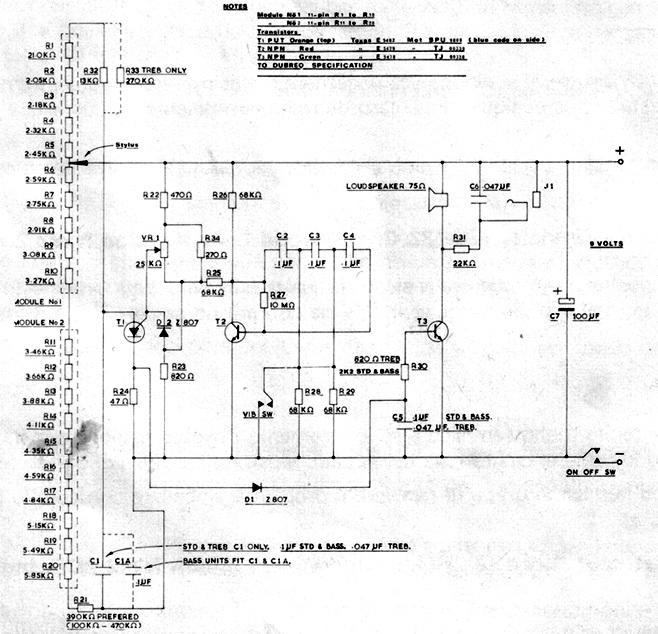 The chip which does all the work is under the black blob; the resistors are tiny surface-mounted (SMD) type. For this reason, modifications and circuit-bending opportunities are a little more limited than with the early series of Stylophones. 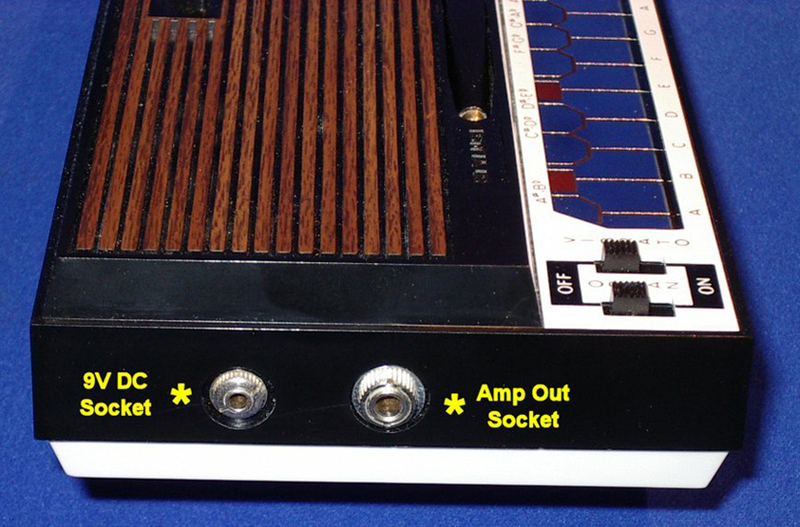 Elsewhere in the blog are one or two examples of my efforts: The ‘Alien’ was my first modification project; the ‘Gemini’ uses two S1 boards in a single case. This one really is miniature! 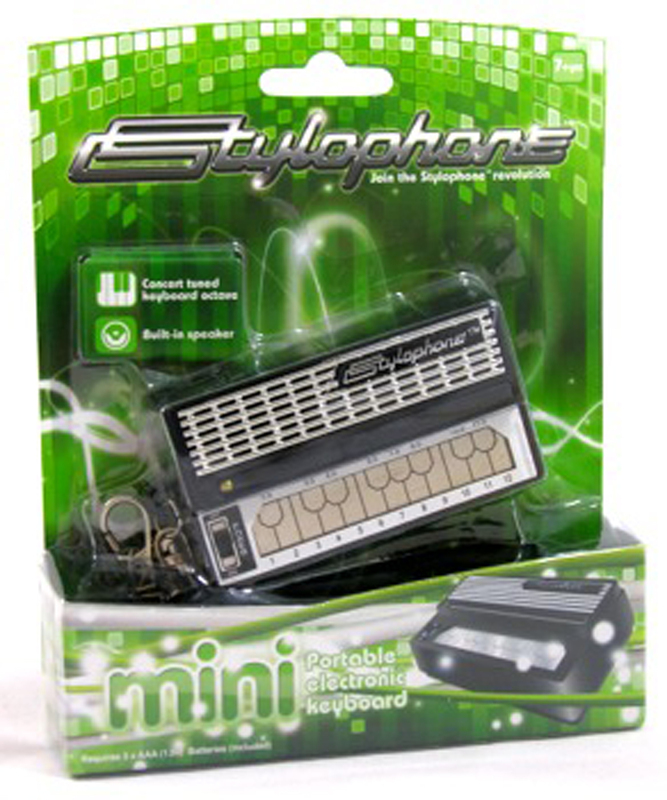 Measuring a mere 8cm x 4.5cm, this is an official Dübreq/re:creation product, and is a perfect reproduction of the regular Stylophone. Powered by 3 AAA batteries, it has a working stylus and the full complement of 20 notes. 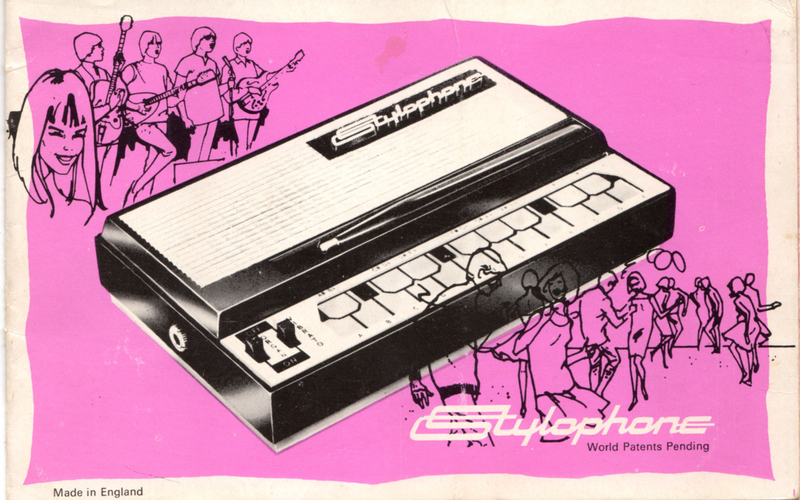 The only thing it lacks is the Stylophone’s traditional Vibrato. 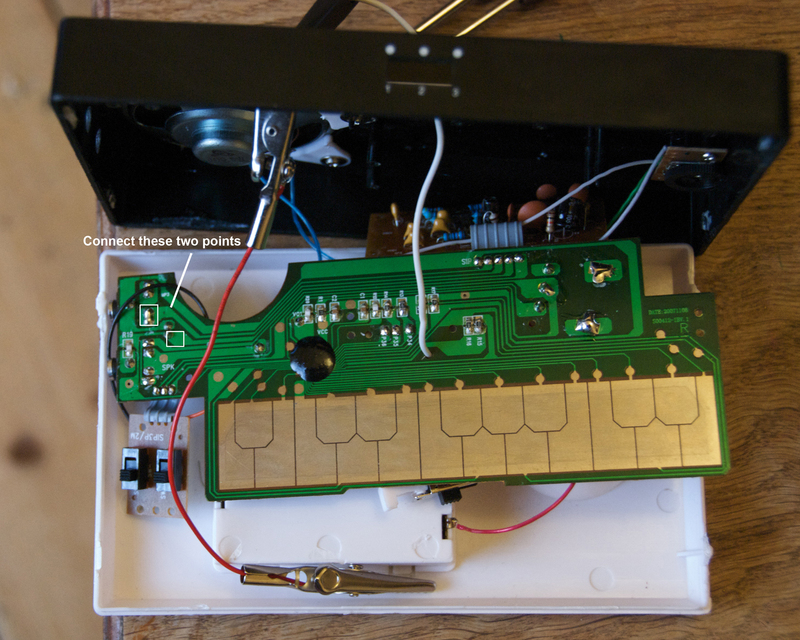 It looks as though the keyboard is connected to a small piezo element acting a sounder, with very little in between! 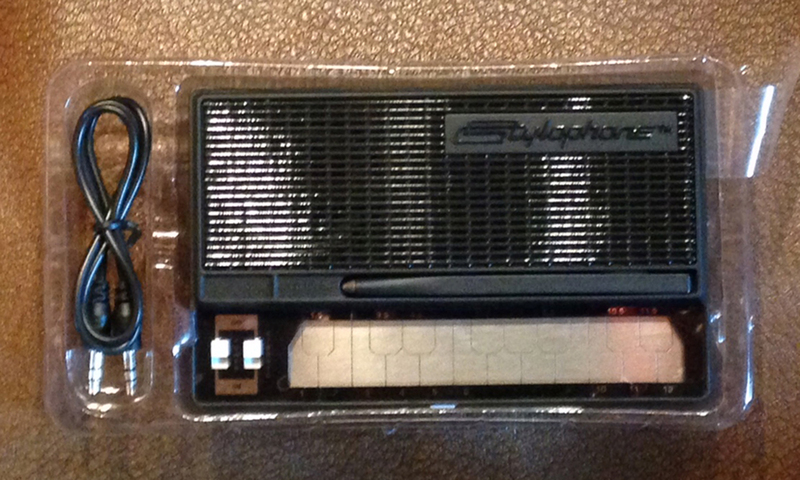 I didn’t take the circuit board out on this occasion to look, but I suspect, like the S1, the chip which operates the Stylophone mini is very small and surface-mounted on the other side. It certainly looks as though modification and bending possibilities are limited.